Making the rounds on Facebook is a button I’d very much like to purchase. 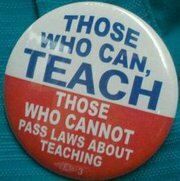 This sums up the last decade of U.S. educational policy: “Those who can, teach. Those who cannot, pass laws about teaching.” From “No Child Left Behind” (promoted by President George W. Bush) to the comparably flawed “Race to the Top” (promoted by President Barack Obama), educational policy has been guided by ludicrous ideas like: rather than giving public schools the funds they need, they should be forced to compete for less money. Also: instead of creating conditions that foster learning, let’s focus purely on testing. And let’s not forget this one: instead of making college affordable to all, states should gradually stop supporting higher education, shifting that cost onto those who can least afford it — the students. Which brings me to my point. It’s time to end the war on education. Really. Stop fighting the people — teachers, librarians, reading specialists, college professors — who are working to educate the next generation of Americans. Stop slashing budgets, firing teachers, interrogating school librarians, cutting salaries, increasing class sizes. Worldwide, U.S. students are ranked 14th in reading, 17th in science, and 25th in math. And we’re dropping steadily. In secondary education, between 1995 and 2008, the U.S. slipped from ranking second in college graduation rates to 13th in college graduation rates. So. Let’s end our race to the bottom. In his last State of the Union, President Obama said that teachers in America should be regarded with the same respect as they are in South Korea, where they’re considered “nation builders.” I couldn’t agree more. But, apart from a tepid acknowledgment of teachers’ rights, the president said little when Wisconsin’s governor sought to cut teachers’ salaries and strip them of their rights to collective bargaining. In that same State of the Union speech, referring to a number of challenges we face, the president called this a “Sputnik moment.” Again, this sounds great. But in response to the last Sputnik moment, the U.S. government invested in education. Right now, we’re busy divesting — indeed, we’re dismantling our public education system. Why? No, it’s not “the sluggish economy” or “we lack the resources” or “in these times of financial exigency, we all must make sacrifices.” It’s because the dominant idea shaping the national dialogue is that capitalism is a moral system, a smoothly efficient social Darwinism that will allow good ideas to thrive and bad ideas to fail: if the government would simply get out of the business of governing, the argument goes, then everything would improve. So, let’s slash taxes on the wealthiest, slash funds from public programs, and we’ll all be happy in a libertarian utopia. This is utter nonsense. People in both political parties need to acknowledge that a progressive income tax is (a) fair, and (b) has helped sustain our public institutions for eight decades. People who make more should pay more. So, yes, eliminating the so-called Bush Tax Cut (extended by President Obama) would be a start. As, of course, would collecting taxes from companies that avoid paying taxes. ExxonMobil, Citibank, Goldman Sachs, Bank of America, and others all had profitable years in 2010, but managed to avoid paying taxes. So, ending corporate welfare would provide another source of revenue. America is not broke. It’s pursuing policies that redistribute wealth to the wealthiest, and thus take funds away from everyone and everything else. One effect is the dismantling of our public institutions — like schools and libraries. These institutions took generations to build. And, now, the nation watches as its representatives undo generations of hard work. We watch as governors and state-appointed lawyers actually accuse educators (in which I include librarians) of being a drain on public funds. UPDATE, 17 May 2011: Jenipher (below) tells me that one can purchase the buttons via UnionButtons. So well-said. Thank you for this honest post. We should be studying other countries that are ranked higher on that list and trying some different tactics. I grew up in Canada, and, while my parents paid higher taxes, my public school education was comparably good (compared to many that I’ve experienced here in the U.S. as a teacher), and I went to an affordable college and had a great undergraduate experience. I’m sure you’ve heard Sir Ken Robinson talk about how our American system “kills creativity,” and how the focus on standardized testing takes time and resources away from following the student and fostering a love of learning. Why did this author use the platform of underperforming education to launch an attack against capitalism and tax reform? Where is the evidence that adding federal control, and federal dollars to the public education system in America has acomplished anything positive? Where is the evidence that public funding of lucrative salary and benefit packages negotiated by national unions for education professionals has resulted in higher performance of the public school student in America? Perhaps the comparison that ought to be made isn’t about how we rank compared to other countries in the world, but to how we rank compared to our own system before it was taken over by national poltics and national labor unions. Perhaps the answer lies in local control, local funding, and local operation. I remain suspicious when an argument is put forward under the banner of education, but the solutions prescribed are all about growing government, consolidating power in the hands of bureaucrats, and vilifying capitalism and its proponents. I gave a beginning journalism class a huge project prior to spring break where they had to work in groups to create positive public relations and advertising campaigns for our school. They had to “sell” the school to parents and students moving into our area. I gave them broad guidelines with choices as to how they chose to complete the project, including producing a video, designing brochures, writing newsletters, taking photos for posters, etc. They then had to present their projects to a panel of teachers who voted on whether they would hire that group to market the school. Many of the groups did outstanding work, but it was very frustrating getting them started! They couldn’t begin to think how they might approach the project as a group – what research to do (and how to do it), what approach to take, etc. I had to spend two or three class blocks just discussing concepts like brainstorming, delegating work in groups, and thinking creatively. Once the groups finally got going, all my students admitted that the project was one of their most fun assignments all year and that they learned more than just reading out of a textbook and memorizing facts. However, this kind of authentic experience is severely lacking in most schools today because of the pressures teachers face due to high-stakes testing. When politicians want to compare us to teachers in South Korea or Finland or Japan, they neglect to point out the differences in working conditions between teachers in those countries and us. Teachers, especially high school teachers, in many other countries get much more planning time during the day than we do. They might teach only three classes and have the rest of the time for lesson planning and working cooperatively. They are actually given designated time daily to work with colleagues. A teacher in Japan was incredulous when I told her that I am expected to teach four or five different courses each year (while supervising two co-curricular activities that require much additional time after school), get only a full plan block every other day, and have no common planning time with any of my colleagues in the language arts department. I think it’s time for a teacher revolution in this country! Thanks to all for your comments! To Mike McFadden: The author (me) wasn’t trying to “vilify capitalism and its proponents.” Instead, I was making a distinction between an economic system and a moral one. Capitalism is an economic system, but it is not a moral one. For example, evading taxes and outsourcing labor to third-world children make make for a capitalist success, but these same practices represent a moral failure. (Feel free to add your own examples here: Goldman Sachs, say?) So, if we attempt to use an amoral system (such as capitalism) as a moral one, then — not surprisingly — we make rather poor decisions. Philip, point taken about vilification. However, perhaps the word gets in the way. As I understand it the word capitalism was coined by Karl Marx to describe our economic system. (I heard this second hand, therefore I cannot vouch for its truth.) Properly refered to as a free market economy, rather than a command economy, it is a moral system. Free people making free decisions about trade with one another in a voluntary fashion. It is when the interference of tax systems and regulation by authorities intervene in the decisions of these traders that the choices begin to take on aspects of immorality. Tying this back to education, I prefer a more free and open marketplace for the delivery of public education so those free choices by the consumers of the product (the parents, specifically, and the students to some extent) drive the quality of the product delivered. This seems to me the moral alternative to a one size fits all mandate from government. I do believe in the public funding of K through 12 because an educated populace is imperative for self government, but the delivery needn’t come from the same source as the funding. Let’s try a free market approach and see what we get. You’ve quite eloquently and succinctly put into words the frustration I’ve been feeling lately with the Kansas Legislature and Gov. Brownback. Down here in Wichita, they’ve had to cut $30 million from the budget because the legislature has deemed that we need to spend less on our (my!) children in the name of balancing the budget. I’m all for a balanced budget, but I think there are other ways than slashing funding towards the education — the future! — of our children. Mike: I think your position and mine overlap on the question of regulation — at least, its role in education. A huge cost (and impediment to learning) is the many layers of bureaucracy under which our teachers struggle. Instead of trusting teachers to do their jobs, we require further assessment, testing, etc., etc. Thinning the ranks of educational/academic administration would, I think, be a step in the right direction. I would also concur that the “one size fits all” model has flaws — hence my advocacy, above, of giving teachers more control over their curriculum, rather than compelling them to simply teach to the test. However, we clearly differ in other areas: your proposed “free market economy” model would work if opportunity, choice, or power were distributed equally. But they aren’t and are never likely to be — under any model of government. There are, however, ways to at least diminish degrees of inequality, expanding the circle of opportunity. Deregulating the market is not one of those ways. So, on this point, we differ — and, I think, are unlikely to come to any agreement. On the term “capitalism.” That’s an interesting question. The word “capitalist” predates Marx by a quarter of a century. The Oxford English Dictionary and Raymond Williams’ Keywords both find its first appearance in Arthur Young’s Travels in France (1792). Marx was born in 1818. As for “capitalism,” Thackeray uses the word in Newcomes (1854). That’s the first instance the OED. You’d think that the word would appear in the Communist Manifesto (1848), but I’ve just done a search: “capitalist” is there, but “capitalism” is not. I think it would be fair to claim that Marx’s writings have added much to our understanding of how capitalism works, but I’m not sure whether we can credit him for the term itself. The businesses that are pushing schools to focus on testing don’t want children to learn to think–because they might think about who is in power. Rich children in expensive private schools have always been taught to think for themselves. Over the last few decades teachers had brought those teaching methods into public schools. Those in power can’t say that they don’t want poor children to be encouraged to think, but they’re doing a great job of changing schools attended by poor children into places where only memorization and parroting is allowed. I’ve enjoyed all of these comments; there’s no easy solution, and the issues are so diverse. I thought I heard the teacher, Ms Lindley, say students are interested in something besides what is being taught. I think this is an issue as well as the funding problems. Our young people are coming from a place never been heard of before. Teachers, parents, students, law makers and adminstrators are not understanding each other’s position or philosophy. I do believe, and I have for sometime that Town Hall meetings need to be held all across the country. This is an extremely good presentation, and I love the title. In response to what Ms. Lindley said about comparing the working conditions of teachers from countries whose students perform better, I agree. I grew up in a family of public school teachers in Canada, and, despite our higher taxes, we had a very comfortable quality of life. Teachers earned higher pay, more benefits, and more respect than I have observed or experienced in the U.S. I’d expect this is what you’d find in other higher-performing countries as well. If we want to attract and retain quality teachers – ones we can, as Philip says, trust to do their jobs – we need to act accordingly. I agree that there are ways to cut bureaucracy, but as far as education spending in general, I think you get what you pay for. In South Korea, education is growing passing most industrialized countries. Over 90% of older students have achieved a secondary education level (placing it at near the top of a small group of world leading countries) and in the younger student groups, it has achieved a 97% rating, placing it at the highest level in the world. SK education is doing a phenomenal job of educating students, and the test scores prove that. They are figuring out how to educate AND have the test scores point to the truth. But in America, we banter about how hard it is to teach kids these days, how leadership doesn’t understand with the laws they are passing, and how much our “rights” are infringed upon when cuts are made. All the while, SK spends about half of the amount (percentage) as the United States on education, however performance is much higher, especially in math skills. The US leads the world in education spending, and our numbers are falling. Our teachers work shorter days (in SK school is from 7:30am to 5:00pm) and get paid nearly twice as much. Spending is not the problem, this article is bunk. SK teachers ARE nation builders because of the job they are doing, and we teachers here in America are not doing as well, as the tests prove, period. Private schools in this country do much better on test scores than do their public counterparts, and they do so with teachers that get paid nearly half and work longer days. And I have heard and researched the claims that this is not a fair comparison because of the cross-section of students in the public classroom, but that is not the case either, I’ll spare the stats here but they do not support that argument. Spending is not the problem, and doing away with testing is not the answer. I am not anti-teacher, just pro accountability. Yes, education in America is in a sad state. This article hits the nail right where it drives the steel into the post containing all the posters and calls to action. Speaking of action, polls show that the public is evenly divided between the need for more money to fund education and the need to spend the money more efficiently. In actuality, both needs are required. This article speaks to increased revenue and spending. What is equally needed is prudent and effective spending. Take for example in the state where I am a college professor, Oregon. The Board of Higher Education has recently released a financial analysis which shows that a mere 18% of the money spent by all public Universities in the Oregon is spent in the classroom. What! Eighteen percent on classrooms! Where did the other 82% go? The answer may be found in the fact that at my college, the largest college in Oregon, we have a total of 15% of our total work force as full time faculty. What 15%! Unbelievable, and that is where the recent trend of meeting all new faculty openings with adjuncts leads us – into what my father (42 year veteran college professor) called “the dumbing of America”. There must be a way out of this ridiculous mess. I firmly believe the only way out, besides increased taxation of the rich and funding education as mentioned above, is to give a binding financial voice to the employees of the schools of America. School budgets are all created by the administrations and school boards. School Superintendents and College Presidents prepare and submit budgets to the School Boards and Boards of Trustees. However these two groups of people or centers of financial planning are indeed one and the same. The Boards hire the Administrators who in turn create and pass budgets and initiatives that are one in the same. There is no balance of power mechanism in this financial system, except by the public picketing the Board meetings and the faculty and classified employees begging the financial power brokers to “SPEND MONEY IN THE CLASSROOM!” At my school, every week there are ads in the newspaper for new employees and replacements for vacancies and they call for dozens of new employees for every full time faculty replacement. In Germany it is illegal for the Board of Directors of any Corporation to have less than 50% of the Board members who are not employees of the Corporation. If the Board is split 50/50 on a vote the Chairman of the Board resolves the deadlock. Guess what, Germany is the largest producer of goods in Europe and the German educational system is strong. In Canada employees are also directly involved in formation of budgets, not just distant advisors with no distinct veto power like here in America. What is needed are State laws which empower the employees of schools financially. There would need to be three parties that all agree to a school budget for State money to be released- the School Administration, the School Board and a representative group of the school employees. Then not only will the schools have more money to reduce class sizes, but they would have the mandate to actually spend this increased budget wisely in order to decrease class sizes and bring much needed technology into the class room. Then watch the outcomes soar. What we need is reading, writing and arithmetic – teachers, books and chalk. We do not need increased spending on initiatives that are not directly applicable to the classroom or pet projects that every administrator seems to come up with. If you want to improve a school – either public or private – ask an employee how this can be done. Then take their advice and get the job done! This is the link to the ACTUAL button that is pictured in the photo that has gone viral. Please consider supporting that company, as they support us: http://www.unionbuttons.com/teachers/index.html Please share this link! You state that “People in both political parties need to acknowledge that a progressive income tax is (a) fair.” What if someone believes that any tax on income is unfair? Are you willing to open your mind to consider that taxing income may not be the best way to generate government revenue? Have you looked into the history of the income tax in the United States? Since you insist that people of both parties acknowledge “a progressive income tax is fair,” do you think that any progressive income taxes is fair or is there a particular progressive income tax that you think is fair? Is there a percentage of taxation that you think is too high? If so, what is the limit that you think is too high? Thomas Duggan: Thanks for taking the time to respond. The logic in support of a progressive income tax goes something like this. If a family of four has to pay 10% from an annual income of $40,000, then they’ll be left with $36,000 to live on. If a family of four has to pay 10% from an annual income of $4,000,000, they will have $3,600,000 to live on. The first group ($40,000) should pay very few taxes (indeed, I’d argue for no taxes); the second ($4,000,000) should pay a much higher percentage (certainly higher han 10%). The reasoning is that the latter group already has more than enough money to live on, & thus should contribute a greater amount to the society. It’s quite possible that you and I will not agree on this point, but that’s the reasoning behind a progressive income tax. The series of questions that follow seem to indulge in begging the question. So, of course there are more and less fair ways to implement a progressive income tax, and a percentage of taxation for a particular income group that would be too high. And so on. The colorful graphic to which you link is interesting, but flawed. The first image is not helpful because it does not measure money spent per child: if a country has a higher population of children, then of course it would spend more. The second one is more interesting because it claims to measure “total annual spending per school-age child,” but the asterisk confesses that the makers of the graph have simply assumed that 1/3 of each country’s population are children. And so, the numbers in that second graph aren’t wholly reliable. I presume that your point in linking to the graph is to indicate that the U.S. already spends a high dollar amount on education. If so, then that’s a very good point. The problem — and here is where our opinions may overlap — is that we’re spending that money in the wrong ways. I completely understand the logic behind the progressive income tax. However, I think that there are better ways to raise government revenue. You used the example of 10%. What percentage of a person’s income do you think is too high for the government to take? If you want everyone to agree that “a progressive income tax is fair,” I want to know which progressive income tax you think is fair and which is unfair. Agreeing to a general statement is a dangerous thing. The cliche “the devil is in the details” is a cliche for a reason. The history of the income tax (as well as Social Security and most every other federal government program) is littered with lies, abuse, broken promises, and unintended consequences. Since you found issue with the graphic, how much money do you think is enough money for education? How does the percentage of money that is currently spent on education compare to the amount that was spent in the past? Have the increased expenditures resulted in increased performance? If you want more of something, subsidize it; if you want less of something, tax it. Thomas: I used the example of 10% because it’s easy to do the math for 10%. Feel free, of course, to substitute other numbers, if you like. Regarding the latest begging-the-questions: the reason that technique is a logical fallacy is that it embeds its assumed answer in the question, without taking the time to offer proof of that answer. So, obviously, I don’t have a dollar figure for “how much money is enough?”: that would vary depending upon the needs of the particular community. For instance, in areas where there’s a high poverty rate, hunger is an impediment to learning: as you might imagine, it’s harder for hungry children to concentrate. I’d advocate sending more resources to those areas — some of which would take the form of subsidized school lunches. I’m not sure where you’d find the money to subsidize something if (as I gather) you’re opposed to taxes, but perhaps you have an alternate plan for funding public education. You’re welcome to use this space to elaborate, if you like. Regarding your “broken promises” paragraph: yes, governments are imperfect, as are bureaucracies of any description. I share your wish that they functioned better than they do. And I’d certainly be in favor of improving the system we now have. Based on what you’ve written thus far, my sense is that you and I are not going to be able to agree on public education. And, of course, that’s fine — we don’t have to agree. I’m certainly willing to concede that it’s a problem with more than one possible solution. I am not against taxes. I do not think that an income tax is the best way to tax. How did you make the leap from that to me “being opposed to taxes?” Because we have had an income tax for nearly one hundred years, my belief is that most people are either unwilling or unable (due to a lack of creativity – Jessica, Ken Robinson’s TED presentation is incredible) to consider other possibilities. I am also not sure how you can judge my stance on public education based on what I have written. I know that simply throwing more money at it is not the answer. There are successful schools that spend less than average and there are failing schools that spend more than average, so clearly the answer involves more than just money. That implies that people must agree with you that a.) an income tax in general is fair and b.) that “a progressive income tax” specifically is fair. Our current tax system is progressive, but you have suggested that changes are necessary. Is our current progressive tax fair or not? If not, why not? Why do you think it is “fair” to tax income? Would you consider alternatives? Clearly any taxes would be paid from from their income, but why should the taxes be based on their income? Thomas: I stand corrected. You’re not opposed to taxes. Thanks for the clarification. I apologize for mischaracterizing your position. I must add, though, that I don’t see what you’re in favor of — as you note, it’s difficult to judge your stance on public education based on what you’ve written. If you’d prefer to keep those ideas to yourself, that’s OK by me. If on the other hand, you’d like to elaborate, do feel free to indicate how you would find the funds to subsidize that which you support (which may or may not include public education). And, no, I don’t think our current progressive tax is fair: as noted above, I think it favors the wealthiest. I’d reduce rates on the poorest and raise them on the wealthiest. Before I get to education and public education, I will finish with taxes. Here is a link to an article on Yahoo: http://finance.yahoo.com/news/Nearly-half-of-US-households-apf-1105567323.html?x=0&amp;.v=1. The top 1% made 20% of the income and paid 38% of the taxes. What percentage of the taxes do you think they should have paid? The top 5% made 35% of the income and paid 60% of the taxes. What percentage of the taxes do you think they should have paid? My point on the income tax is that there is room for debate, and ideally people in “both” (major) parties should approach taxes with an open mind. Suggesting that there is no room for differing opinions on the progressive income tax is too simplistic. Unfortunately, most political discourse today is too simplistic – left/right, democrat/republican, for/against, etc. Thank you for taking the time too reply. I will be away from the computer for a while, possibly the rest of the day, but I will return again for further polite discourse. Sure, feel free to add more tomorrow. My main point, really, is that we get what we pay for: if we strip away means for funding education, libraries, and so on, then… we end up living in a society without those things. I’m glad to have my taxes raised if doing so means that my local schools can afford to hire teachers, public libraries fill vacancies, and so on. And, beyond that, I don’t think I have much more to add. I get a chuckle out of teaching being described as a “profession”. I thought that a profession was something the successful practice of which required special training in the field to obtain appropriate credentials, like engineering, lawyering, doctoring, etc. Well, not the case for teaching (except the credentialing part for the public school systems). All that is necessary in order to be a successful teacher is: (1) knowledge of the field(s) you intend to teach; (2) Communications skills; and (3) Some enthusiasm for and interest in your students. Please note that all of the above items can be obtained without every taking a single “education” course or obtaining any credentials from the “education” establishment. I taught successfully for many years at private institutions of learning without every taking a single “education” course or paying the slightest attention to the fads periodically trotted out by the education establishment. Oh, yes, I also designed my own curriculum for each class that I taught. Wow! Teachers make about $2100 per month there. Our US teachers must be overpaid, right? Think again. Look at what Korean engineers make: about $2200 per month. Korean programmers? $2245. Comparing their teacher pay to our teacher pay is purposefully deceptive without looking at their entire salary structure. A second problem I have is pretending that our problems rest with our teachers at all. Our science scores are not great when compared globally. Teachers’ fault? How about the fact that learning the metric system is a major challenge for kids raised in our backwards obsolete American measurement system. Their kids know what liters and milliliters are before they hit 12 years of age… ours need constant exposure and practice to stay on top of what they learn. I’d like to put a Korean teacher into our system and see how that turns out… but heck that doesn’t happen. You know what does happen? Other countries are happy to hire American teachers with experience, because they look up to the creativity and individuality that our more progressive classrooms provide. I’m not saying our teachers are better. I’m just saying our system is what’s broken, and blaming teachers will only make it worse. Lowering pay for teachers is not going to help. This year here in PA I’ve now seen 5 jobs for science teachers starting at a lower salary than I made as assistant manager working at Starbucks years ago. Yeah, that’s still way more than a Korean teacher, but really there is NO COMPARISON in job responsibilities. Our system needs overhaul, and the peanut gallery that blames teachers needs to be ignored while we work on it. In a very similar sense, the biggest problem our educational system faces is people with strong opinions about things they were tooled to believe by well-funded think tanks feeding the Rush Limbaugh radio station or Fox “News.” And yep, sure enough, their opinions end up being what welfare-for-the-rich forces want them to think. The best part of public education in the U.S., which is a phenomenal success, as it is in all the other countries with strong teacher’s unions and thus the top, world class test scores year in, year out, is not having to pay an annually increasing (thanks to the wonders of capitalism) percentage of profits to shareholders out of every education dollar. 100% of education money can go to education. As for unions, widespread unionization (along with many policies considered “socialist” by political conservatives today) accompanied America’s rise to becoming the pre-eminent global economic superpower with a vibrant middle class (another reason education used to be so much more successful–families were more primed for educational success due to less economic stress). Of course the demonization and decline of unions, along with more free-market policies over the last 30 years, has accompanied the decline of the American middle class and our economy in general. Which brings me to my last point, why is it political conservatives have such a disdain for people freely associating to bargain in the free marketplace? Unionization in and of itself isn’t even a governmental entity. The answer of course is that collective bargaining benefits the people doing the work over those who wish to idly cash in on it. At any rate, for those who don’t want to pay taxes allow me to invite you to move to Mexico, where the tax rates are much lower, or free market Somalia even. Bet you’d prefer to have your own kids in schools in the more “socialist” countries with strong and well-respected teacher’s unions and the world’s top test scores. I just came upon this conversation tonight and have enjoyed hearing everyone’s different points of view. What an awesome country we live in where people can debate so openly and freely. On a more personal note for me, I completely agree with the statements that say “stop blaming the teachers!” Unless you have taught in a public school classroom, especially in a high poverty area, you have nothing to say about what teachers should or should not do. That would be like me telling someone who fishes for halibut off the Pacific coast how to do their job because I ate halibut for dinner. A country’s school system is a reflection of it’s society in general. What is the focus of most American families, especially those that fail in school the most? Is it education? I don’t think so. It’s survival, it’s entertainment, it’s self-indulgence, it’s blaming someone else for their troubles and waiting for someone else to fix it. Notice please that I did not say all. I certainly know families who have experienced hard times and still manage to maintain a strong work ethic and high standards for their children when it comes to respect in the classroom. Unfortunately, in this day and age, it is much more the exception than the rule in many places. To the critics who love to compare our school system to other countries I say this: go to those countries and see just how much emphasis is put on education at home. Look at how much more competition there is just to get into some of their high schools and colleges. Notice how the responsibility of being educated is placed on the person getting the education. Personal responsibility is not a popular idea in this country. Until you can get a community to believe that they are indeed in control of their own educations and that of their families, no laws or government mandates or federal funding will make the slightest difference. The students and parents need to be held accountable just as much as the school, the administration, and the teachers. Do we blame the dentist if his patient’s teeth fall out because they never brush and eat only candy all day long? Contrary to popular opinion, bad teachers do not make up the majority of our classrooms that are “failing”, every inadequate teacher is not being protected and kept in classrooms because of tenure and unions. I personally know of several struggling teachers that have been removed either by administration or by themselves. Is it a perfect system? Of course not. Can you name a profession anywhere that doesn’t have at least a few people that don’t “pull their weight”? I think people have watched too many movies like “Stand and Deliver”, “Dangerous Minds”, and “Lean on Me”. These are all based on true stories, but the reason they were made into movies is because those circumstances are special and don’t actually happen every day. It really doesn’t. Do teachers strive for their students to be as successful as possible? OF COURSE THEY DO. Are teachers robots that work 24 hours a day, 7 days a week and carry a magic learning wand in their pockets? No, they are real people with families and pressures and guess what… flaws of their own. If a students in this country ACTUALLY tries to get a good education, they will… regardless of where they went to school. Will it be equally as good everywhere? No, but this isn’t a movie. This isn’t a fairy tale. It’s real life. And as much as we strive to make life as fair as possible, it never will be. District policies nationwide over the past few decades, bandwagons if you will, have seriously limited teacher effectiveness and student success. Decreased budgets. Decreased staff. Increased class sizes. Increased teacher-student contact time during the school day, at the expense of cutting teacher work/planning/preparation time. Forced inclusion without the necessary support systems to make it viable. And of course, there are all the fads that school districts insist their teachers practice, in the hopes of boosting student performance and finding the ‘magic bullet’. Forcing highly educated and experienced teachers out the door, so first-year teachers can be hired in their place (saving the district thousands, I’m sure), is a practice fraught with long-term repercussions, yet it is becoming increasingly common in today’s school systems. Despite these kinds of practices, when students aren’t performing well on standarized tests the finger of blame points to the classroom teacher. We’re not doing enough. We’re not using the most productive practices. We’re not effective educators…if we were, all of our students would be passing the tests with flying colors. Gone are the days when we proclaimed standarized testing was not the sole reflection of a student’s knowledge, and cannot be the only measurement tool used. Gone are the days when ‘teaching to the test’ was abhorant, and a gross disservice to our students. Gone are the days of a well-rounded education, or even of a quality classroom experience. We are now pushed to cram heads full of information needed to ‘pass the tests’. Whether they internalize it, remember it, or can actually ‘think’ is completely irrelevant. I have personally seen classroom teachers trying to teach a core subject without textbooks, without supplies for hands-on activities (unless they purchased it themselves), and without functional technology. My personal experience is teachers working through lunch periods, putting in 10-11-12 hour work days, taking hours of grading home, and coming in on weekends, just to keep their heads above water. The need for documentation and accountibility, while having some merit, has become a paperwork nightmare that consumes valuable teacher time with a voracious appetite. The voices of teachers who understand the educational needs of students, and who see the pitfalls in many of the decisions being made in today’s schools, are not heard. We are at the bottom of the food chain. We no longer have any control over the policies and decisions that impact the students in our classrooms…yet we are the easiest target when things go wrong. Someone, after all, must be the scapegoat. Our district can afford to pick up the cost of sending our school board to Florida for a national convention, but we can’t afford to bus our students to an educationally-sound field trip. We can rubber stamp as much as a $6000 annual raise for the ‘doctors’ in a district administration office (all four of them), while haggling over a $300 annual raise for classroom teachers. What is wrong with that picture? Our priorities are skewed. The brunt of society’s ills are being laid at the feet of educators. If we did more. If we did it better. If we worked longer hours. If we worked more days a year. If we spent more of our paychecks on our students. If we spent more time and money on professional growth. If…if…if…more….more…more. Yet, in all that clamor for more, no one mentions more pay for those educators…more planning time…more staff hired to work directly with students. Society wants, wants, wants, but it doesn’t want to foot the bill. I apologize if I’m sounding bitter and resentful. To be honest, it’s hard to express these feelings without sounding like a whiner, and I really don’t like whiners. I am thankful to have a job. I love teaching. I’m a very good teacher, one that stays current with educaitonal research and practices, and knows how to structure a classroom and curriculum that is conducive to student learning and success. Yet, I feel that I’ve stepped into a Catch-22 nightmare. There is no way to win…not for educators, and not for students. There are only a few of us left that have the ability to think rationally and tap into common sense…but at the moment, we’re counting the days to retirement. I never imagined I would ‘want’ to retire. Teaching has never been ‘just a job’ for me. It’s a calling. It’s a passion. It’s my profession. It’s a reflection of who I am. Yet, the toll on my mental, phsyical, and emotional health is unquestionable. It is incredibly painful to see education warped and manipulated as a politcal tool. It is tremendously depressing to be forced into classroom practices that you know are anti-productive, and will have lont-term negative consequences. I’ve seen intimidation in the workplace take on a whole knew meaning. It’s not just teachers that are impacted. Students suffer the effects, as well. I am so glad my own children are out of the educaitonal system…but my grandchildren are just starting that journey. It breaks my heart to see what America has done to its schools. This isn’t a ‘teacher’ issue. This is a reflection of our society…its immaturity, its egocentrism, its greed. We do not value education in this country. We take it for granted. You cannot force Americans to think of educators the way other countries do…because folks in today’s America have never had to live without the advantages a free education provides. They have no basis for understanding how precious it really is…and how fragile. I don’t know the answer. What I do know is, people who understand nothing about the reality of teaching today’s youth, are making decisions that impact our schools. What I do know is, we are willing to foot the cost of supporting professional athletes pulling down million-dollar salaries, but we resent what it costs to educate our youth. Why is the ability of business to avoid taxes relevant to education? This is not an economic matter: it is a moral and spiritual matter. Why are American schools teaching to the test? One quick answer that may be closer to the truth than any posturing is that too many teachers are not sufficiently interested in teaching that they have to be regulated closely. Consider that teaching is less insecure than most other jobs, and does not require the complex training of engineering or medical professions, and which offers simple goals and clear instructions for achieving them, and you see a combination almost designed to attract the less-capable. But before that is changed, consider also that America has no goals. No more space race, no more evil communist enemy, no more imports to counter with better products — there is nothing to strive for. Find a goal the country can agree upon, and things will change. However, this will never happen. The ascendency of multiculturalism has produced a society that is focused on its differences — not its similarities. The future of education in America may very well turn out to be private schools and homeschooling. The government-financed schools have changed into mills for production of a standard item.